Zappiti Video is a system for managing collections of movies and TV series for multimedia players (compatible with Zappiti 4K HDR and Zappiti Player 4K ranges). 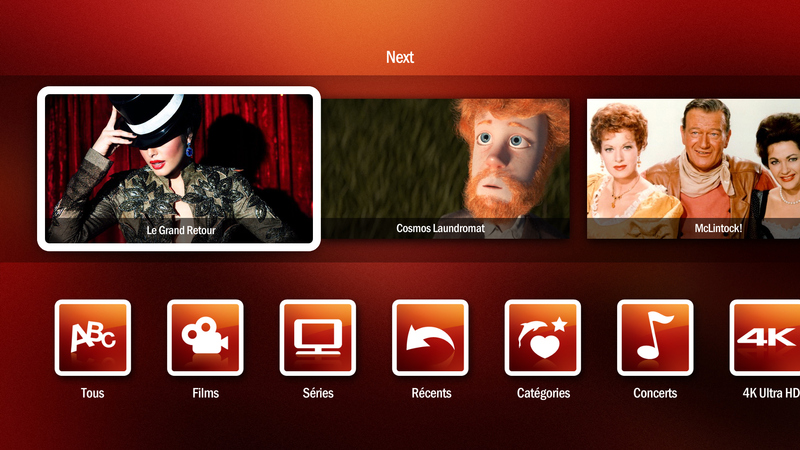 Zappiti automatically analyzes your movies and TV series and collects info, summary, poster and wallpaper. All video files are organized automatically by categories. You can then sort your movies using filters and find them through a powerful search engine. Compared to previous versions (Zappiti Media Center), Zappiti Video offers many advanced technologies and many new features. To learn more about the power of Zappiti Video, please visit the dedicated page by clicking here. 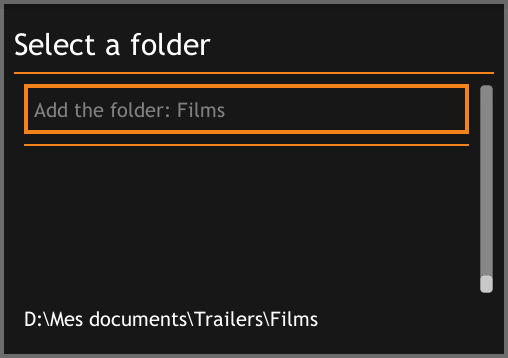 Before to start to create a movie collection, you must create a "Movies" (or Films) folder on your HDD. Place all your movies inside this folder. If you have TV shows, place them in a dedicated folder named "Series" or "TV Shows". If you want, you can add subfolder but it is optional. But it is very important to have 2 main folders Movies and TV Shows. If you own a Zappiti NAS RIP 4K HDR, you do not have to create this folders because they are already created. 1. On your local drive (or your NAS if you have one), please create a movie folder named "Movies". Place all your movie files in it. 2. Your movies should be named with the title of each movie. For example, the file of the title "Metropolis" should be named "Metropolis.mkv". You can create subfolders in the folder " MOVIES " if you want. 1. On your local drive (or your NAS if you have one), please create a "TV Shows" folder. 2. Then, create a subfolder for each TV Show / Serie. You can create a subfolder by season if you want. Then , place all your TV Show episodes in it. 3. Your episodes must be named as: "Seriename s01e01". Note: the filenames such as "Seriename 1x01" are also supported. Start your Zappiti media player. On the main page, click on the firt button named "Video". After a few seconds, Zappiti will suggest you to select your language. 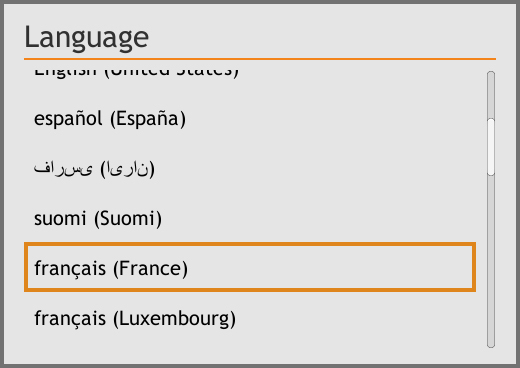 Use the DOWN and UP arrow buttons on the remote control to scroll through the list of languages. Highlight your language and press OK to validate. 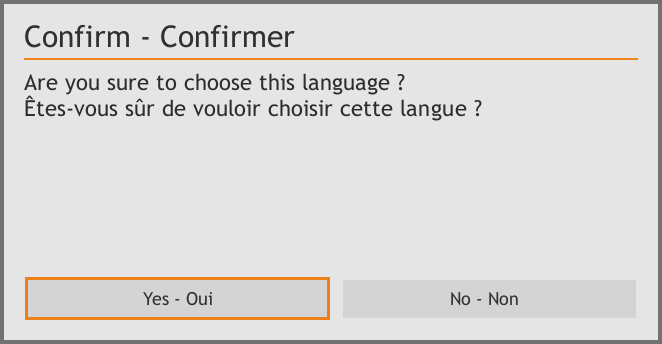 If you are sure you have selected the correct language, click the OK button. Otherwise, click No and select the right one using the same procedure. Warning! This language setting is only effective on Zappiti applications. To set the keyboard language (in QWERTY by default / not supplied) and language for Android settings (in English by default), press the GREEN button on the remote control, then click Language & Input and select your local language for the interface (and the keyboard if you use one). To return to Zappiti after this adjustment, press the Z button on the remote control. Then you will see an info panel about the remote control. 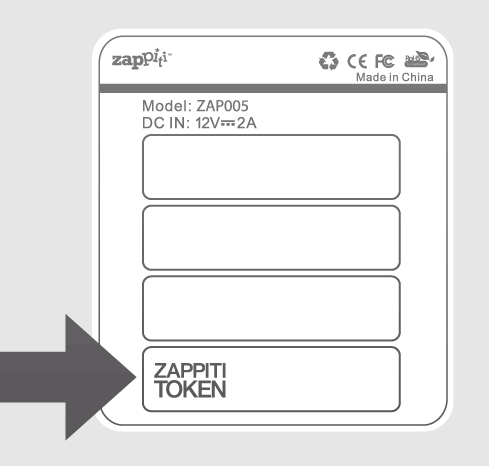 If you have computer mouse connected to your Zappiti for third party applications, please note that is not compatible with Zappiti apps. 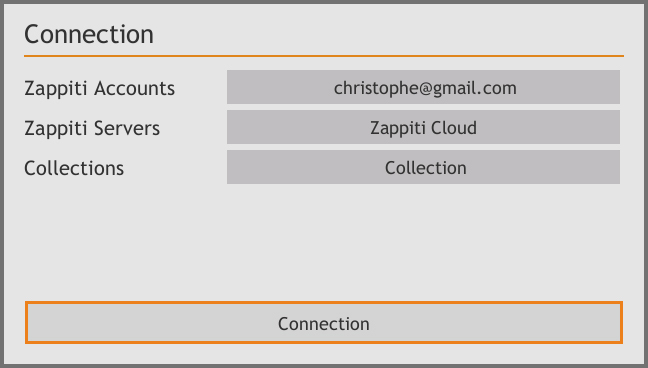 But you can use a keyboard in Zappiti apps (for instance to enter your credentials). The next panel will invite you to create a Zappiti Account. If you already have a Zappiti account, fill in your email and password and click on "Login". To type your credentials, remember that you can use a connected keyboard. 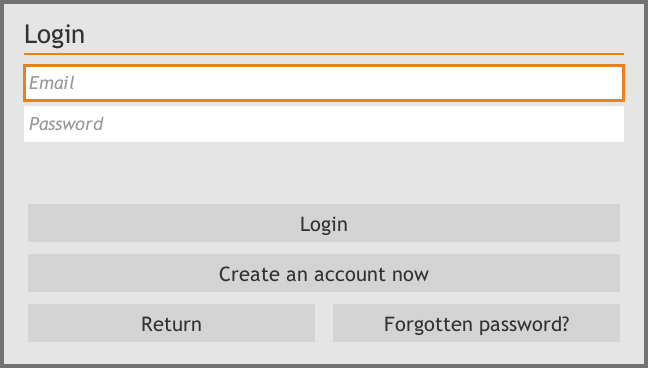 If you have forgotten your password, click on "Forgotten password?" and follow the instructions on the screen. If you do not have a Zappiti account, click Create an account now. Then, follow the instructions on the screen to create your Zappiti account. 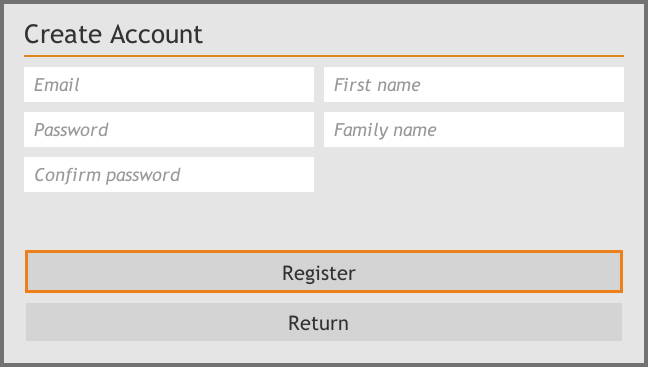 After completing the fields on the Account Creation page, move the cursor to Register and confirm with the OK button on the remote control. Then, enter your Token number. You will find it on a label located on the underside of your Zappiti unit. Warning! This "Token" number can only be associated with one Zappiti account. 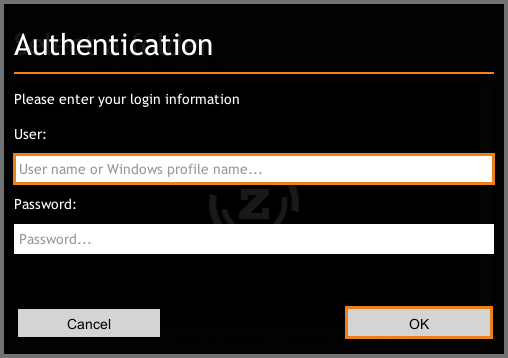 So please choose carefully before associating the Token number to an account, and please note your Zappiti Login (your email address) / Password associated to the Token Number somewhere to remind it if needed later. Note: If you see "This token number is already used," perhaps you have already registered your player with a different email address. In this case try a different email address. If it stll does not works, please contact Zappiti user support. You will then come to the server selection and collection page. A first collection is created by default. But you can rename it. To rename a collection, just click on it then use LEFT/RIGHT to select the dedicated TAB. After selecting your account, your server, and your collection, please press Connection button. To add a folder containing movies or TV shows, please click on the dedicated button located on the first tab (Folder). Then, click to Add a folder containing movies (or TV Shows). If your files are located on a local storage, please click on Zappiti player. Then click on the storage name. Then explorer it and go inside the Movie (or TV Show) folder. Then, when you are in the folder MOVIE (or TV Show) click on Add the folder button. If your files are accessible through the local network, go down the list to find the name of the machine. Caution, we advise you not to use password containing special characters. 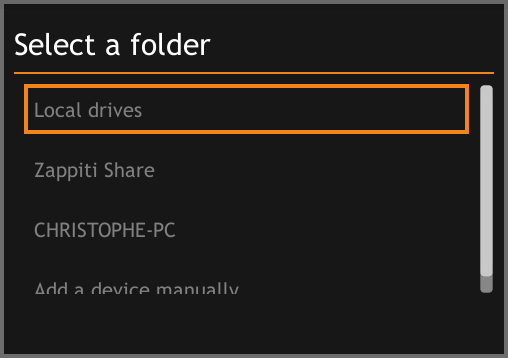 If you want to share a folder on Windows, right-click on the folder and select the "Share" option. If you can not find the name of your network device, click "Add a device manually" and enter the IP address of the network device and enter the username and password of the share folder (not your Zappiti credentials). If your files are located on a networked computer, by default the credentials are the ones you are prompted for when you start your computer. Note: If you do not use a password, you can try to enter "guest" instead of the password. Then explore it at locate you folder containing your movies (or TV shows) and click on it. Example: If you want to add the "Movies" folder, do not browse deeper than this folder. Indeed, you can have subfolders in the "Movies" folder, but it's only the Movie folder you need to add, not a subfolder. In this way, all the films contained in this folder and its subfolders will be scanned. Note: only folders are displayed. The files are purposely filtered to make the configuration simpler. Warning! If you add a subfolder within the "Movies" folder, only movies in that subfolder will be scanned. If your path is incorrect, you can modify it by using "Edit" button. Press "Delete" button to delete the folder from Zappiti. (Don't worry! Your movies will not be deleted). If you want to add another folder containing movies or TV Shows, please click on the dedicated button. Then, press RETURN if you don’t want to add another folder containing movies. 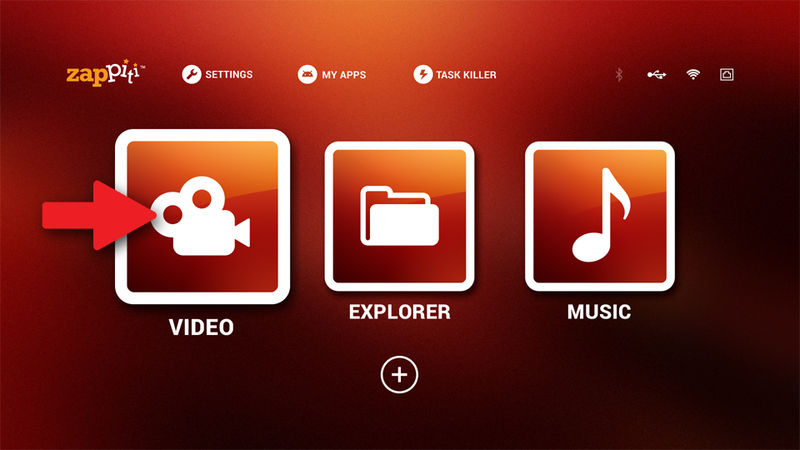 Zappiti will start to scan your folders and analyse your video contents. You can see the current scan taks in a dedicated panel. To close the current task panel, press RETURN button of your RC. If you close it, you can display it again through the MENU button of your RC. Done! Now you can enjoy your Zappiti collection! To access to additional features, press MENU button of your IR remote control. When you add a movie file to your "Movies" folder, Zappiti will automatically index it durin the next restart of the application. To force the analysis, please use the dedicated option located in the Zappiti Menu. (Please use Menu button on the remote). When you delete a movie file from your 'Movies' folder, Zappiti automatically remove his cover and descriptive page from your Zappiti collection during the next analysis. Warning! You can manually remove a movie cover using the "Delete" option located in the Zappiti menu. But this does not delete the movie file. Thus, in the next analysis, the movie cover is regenerated. To permanently remove a movie cover from your Zappiti collection, please physically delete the file stored in your "movies" folder or move it to another folder outside the "Movies" folder. > Films not indentified by Zappiti. How to identify it? > When a movie is incorrect, how can I identity it again?